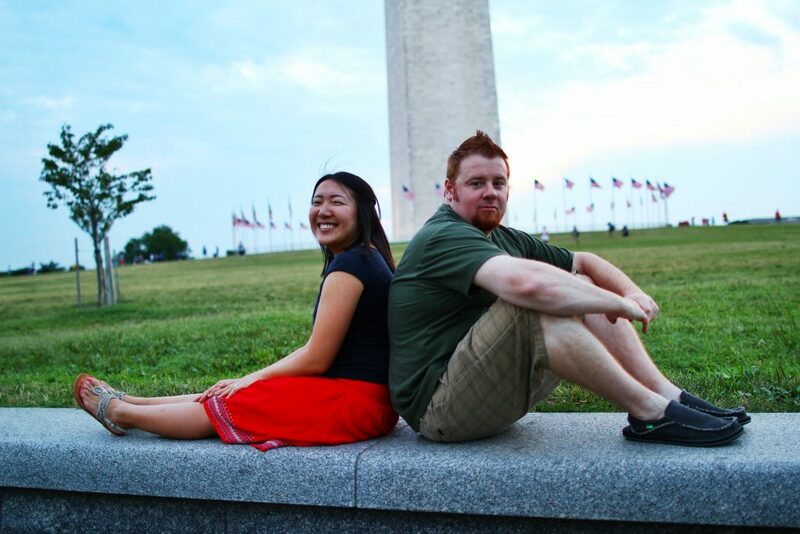 Mayumi and I met a few weeks back when she sent me an email saying she was so happy she had found my blog because she and her fiance were planning a small-budget wedding in DC and they needed some help. We shared a few emails and I was ecstatic to learn that Mayumi is practically my NEIGHBOR as she is a student at Gallaudet University – the only liberal arts university for deaf and hard of hearing students, which is located near my house in NE DC. Mayumi’s fiance JD, and her parents and grandparents (in Japan!) are all deaf. Somehow, Mayumi explained to me, she was born with the ability to hear and is what the community calls “CODA” [Child of Deaf Adults]. Obviously ASL is a huge part of both Mayumi & JD’s lives and they want their wedding to incorporate this part of their lives, into it. Personally, learning ASL is on my short-term life goals list, especially now that so many of my neighbors are deaf or hard of hearing, and it’s such a part of the greater H St./NE DC community. Meeting Mayumi and learning her love story and hearing of her wedding plans have only strengthened my desire to do so. I apologize for all the back story – but I feel it was important to share – as so much of my blog stems from the people I have gotten to meet as a result of running it. I consider myself lucky to get to meet so many wonderful, different, and unique people in the DC MD and VA area and also get to learn and share their love stories. SO – onto the real purpose of this post – Mayumi & JD’s Offbeat Save the Date Video! One part “about us” one part “save the date” the couple made this video themselves! We have our save-the date announcement video (it is sort of like our engagement photos…but we made it into a storybook style video). I was born in a city famous of its extreme temperatures (BOILING HOT in the summer and FREEZING COLD in the winter) called Kumagaya, Saitama prefecture. At 15, I decided to move to Canada to study English…met my Canadian family and so many wonderful friends. After college, I made another life-turning decision to move to Fremont, California to study American Sign Language (ASL). Currently, I live in Washington D.C. awaiting to receive my Master’s in Deaf Education next May. JD hails from Virginia. You know when you see a geek that has a fascination with comics, drawing, and ASL storytelling, well, that’s him! We were both students at Ohlone College, CA when we met. JD was Mayumi’s ASL tutor for two years…and we’d been friends for a while until sparks eventually developed! JD proposed on his iPad! How appropriate is this, considering his devotion to apple products (Steve Jobs would certainly be proud!). With his iPad on his left palm, he showed a receipt for a pair wedding band purchase displayed on his iPhone on his right palm. A proposal on an iPad?! Love the geek chicness of this – can’t wait to see how their wedding turns out! Thanks for sharing Mayumi!! !